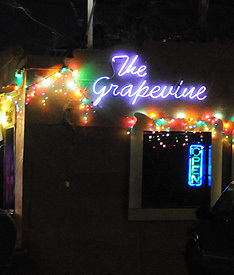 Grapevine is for those in search of adventure. The drinks are stiff, and the crowd is always strange, and we mean that in a good way. People watch on the patio, shoot pool, or play some tunes on the jukebox. Shoot some hoop every day but Sunday when the basketball court turns into a ping pong hang out. The bar opens at noon on Sundays during football season.